Well, engraving the tiny Orca knife in antler was so much fun, I just had to continue on in the same vein, so the Celtic Lizard pendant was born. A little less than 2 inches tall, engraved and carved from naturally-shed elk antler, with a titanium backing and massive silver bail. I aged the antler with potassium permanganate, and used cold connections to fasten the titanium backing to the antler with silver rivets. And, below, a larger detail picture. Thanks for looking! 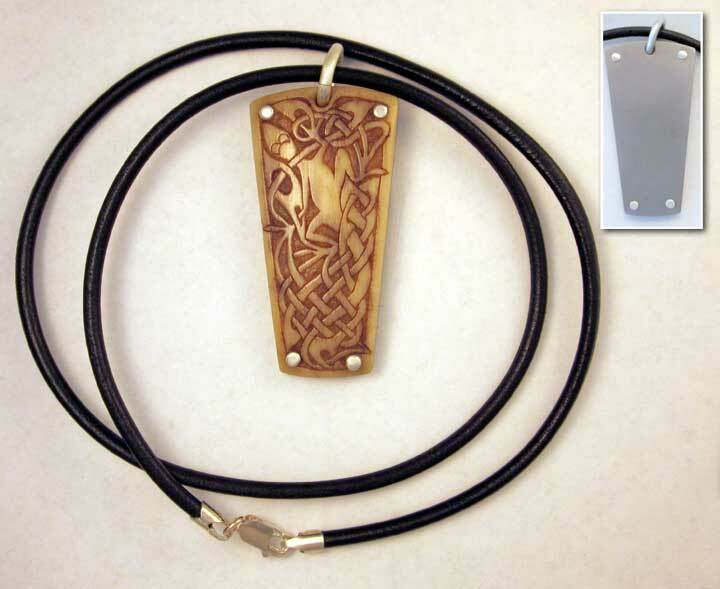 This entry was posted in Carving, Jewelry, Pendant and tagged antler, carving, engraved, engraving, fabricated, fabrication, titanium. Bookmark the permalink.